Opened by the Queen in late November 2004, the Wales Millennium Centre has provided a spectacular new home to performing arts in Wales. The building - though not strictly known as an opera house - is home to the Welsh National Opera and 6 other art companies. Its distinctive design is loved by some and hated by others. It has been nicknamed ‘The Armadillo’ by locals who have likened its huge curved bronze-coloured roof to the said animal. The brief was to create a building that was “unmistakably Welsh and internationally outstanding”. The architects (Percy Thomas) set about fulfilling this brief by incorporating many traditional materials from around the principality, including wood, steel and slate. The overall effect of this 1900 seat venue is very impressive. Wales Millennium Centre has succeeded in bringing many big-budget West End (and Broadway) shows to Cardiff, such as Miss Saigon, Starlight Express, My Fair Lady, Guys & Dolls and Footloose, plus many more. If you are not booked to see a show at the Millennium Centre, you can enjoy a guided tour of the building instead. Tours of the building last about an hour and run daily. Also housed within the Wales Millennium Centre is Ffresh, the WMC's new in-house restaurant, which serves modern Welsh cuisine. 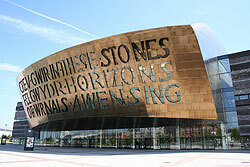 Wales Millennium Centre will act as the night venue for WOMEX 2013, a prestigious international music expo. Times vary according to performances. By car: Leave the M4 at junction 33 and join the A4232. Follow the A4232 for about 9 miles and take the Cardiff Bay exit (just before you reach the Butetown Tunnel). Continue straight along Stuart Street and turn right at the first set of lights you encounter, where you should then see the Wales Millennium Centre front entrance. By bus: Bus numbers 1, 2, 6 (Bay Express), 8 and 35 all serve Cardiff Bay. Main show prices vary, but there is a free daily performance in the foyer area. Guided tours of the building cost £5 per person (£4 concessions).